Located in the Aspen building of the Paradise Condominiums, this is a very comfortable, designer furnished and decorated, two-story, Non-Smoking condo with art and interesting antiques. Each of the four bedrooms has its own private bathroom with a hair dryer. The two downstairs bathrooms have walk-in showers. The two master suites downstairs have king-size beds and each of the two upstairs bedrooms have extra long twin beds. The loft also has a sofa that makes into a queen bed. Each bedroom has its own flat-screen TV, with a DVD player. Also, there is a TV in the loft. A monitor is available at the computer desk in the loft for connecting a laptop. Also available is access to wireless high speed internet. The printer in the loft is wireless enabling you to make copies or print from your laptop, iPad or iPhone. A hard line phone and answering machine keeps you in touch with the office or home while on the ski slopes. A complete entertainment center is in the den, including a Blue Ray player. This end unit condo with an outdoor deck provides outstanding views of the ski slopes, surrounding mountains and fabulous sunsets. A natural gas grill is on the deck for your use. The bar and kitchen counters are granite and the kitchen is completely equipped. We have a coffee bean grinder and a regular coffee maker. We also have a Keurig so be sure to bring your favorite K-Cups. The full size washer and dryer are located in the kitchen area. Just past the kitchen and bar is the dining area that seats six at the table with four additional bar stools at the bar. Beyond the dining area is the living area with a large sectional sofa that is perfect for everyone to gather around the gas fireplace to discuss the day of skiing and watch TV together. A short 100 step walk across a parking lot from the condo door and you are at the loading point for the West Wall quad lift. In the afternoon, you are usually able to ski right to the condo door. There is a sledding area next to the condo and we keep a supply of sleds available for our guests' use. At the end of the day, join fellow skiers for fun in the large outdoor hot tub located at the end of our hallway. The area's free shuttle bus stops directly in front of the condo. The shuttle runs all over the ski mountain and to the shops and restaurants in Crested Butte. Daily or semi-weekly maid service is also available upon request through our managers. Mary Sue and Jim Westmoreland live in Houston as does our daughter, Susan McConkey and her family. Our Daughter, Laura DeVega and her family live in Dallas. Mary Sue graduated from Oklahoma University and Jim attended the University of Texas before graduating from Baylor School of Law. Susan graduated form Baylor and Laura graduated from UT. Football season is always a challenge around our house!. Jim is an attorney and one of the seven partners that designed and built the Paradise Condominiums. Our condo is also our second home as we live there for four months in the summer. Being our summer home, the condo has many features and amenities not found in your typical rental units. 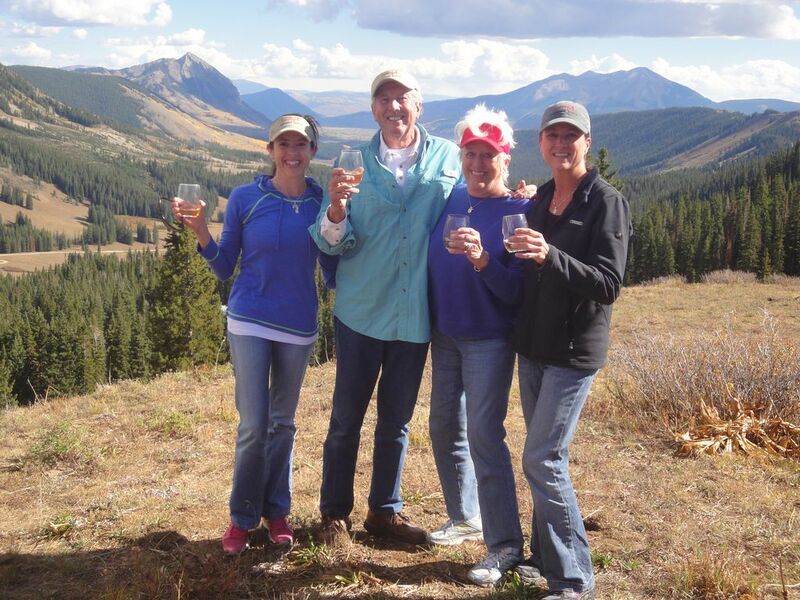 I'm sure you will enjoy our condo, the quaintness of town of Crested Butte , the views, the wonderful location of the condo and will quickly understand why spend a third of our year in Crested Butte! You will want to return! Two. Coffee bean grinder and drip coffee pot. Also, a large Keurig coffee maker. Free Domestic Long Distance Calling, Instant Hot Water Dispenser, A hair-dryer in each of the 4 bathrooms, Hot Tub and Sauna (shared), No pets, The Mountain Shuttle Bus stops directly in front of our condo. Very comfortable. Beautiful setting. Had everything we needed. Wonderful ski vacation. Condo is just as described, abt 100 yds to the lift. Small kitchen, but nicely appointed, had everything we needed. Comfortable beds. Lots of hooks and handy storage for skis, jackets, etc. Fun art and thoughtful decor. Prop mgr, Nick, and homeowner, Jim, were easy to work with and very attentive. Definetly recommend and would stay here again. Ursula: You and your family were wonderful guests. Welcome back anytime! We had a group of 8 adults and had a perfect time at the condo! Jim was so easy to get ahold of and accommodating, he really wanted to make sure we were comfortable and had everything we needed. The condo was definitely a home, and each room had a fan and humidifier and it’s own bathroom with a shower. The kitchen was well-stocked, and we did a ton of cooking. Very easy access to the slopes, a true ski in and ski out. Also very easy to ski over to the main office for those who needed passes. I would definitely return, and highly recommend it. Beautiful condo, great location. Owner Jim was very responsive to any inquiries. Will definitely stay there again! Lovely group! Welcome back anytime. Fun place to stay in CB!! Shelly: Glad your family enjoyed your stay. Come back anytime. Outstanding property and a great location! What a great property! Just got home from a weekend getaway with some friends and we all felt as if we could not have picked a better location. This property had everything we needed during our stay with easy access to and from the ski lift and town (via the bus). Both Jim (owner) and Nick (property manager) were extremely prompt and helpful with any questions we had. We all cannot wait to go back again and hopefully make it an annual trip! Brian: So glad you and your group enjoyed your stay in my condo. You are welcomed back whenever you plan your next ski trip. The condo was perfect for our group of 9. It had everything we needed. The skiing was excellent and the snow on the last 2 days have been an extra bonus!! Lisa: Glad you enjoyed your stay in our condo. We spend the summers there so it is a little more "homey" than the commercial condos. I would like to take credit for providing the great snow, but I have a few limitations on what I can offer.......Come back anytime! The calendar automation doesn't allow entering a check-out and check-in on the same day, but that is always available when determining the days of your visit. Check-out is at 10:00 a.m. and Check-in is at 4:00 p.m.